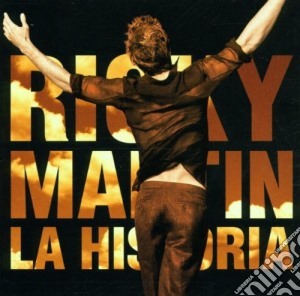 Ricky Martin - La Historia: 1. MARIA-RADIO EDIT REMIX-SPANGLISH VERSION . 2. VUELVE . 3. BELLA . 4. LA BOMBA . 5. A MEDIO VIVIR . 6. PERDIDO SIN TI. 7. LIVING LA VIDA LOCA-SPANISH VERSION . 8. VOLVERAS . 9. LA COPA DE LA VIDA-SPANISH VERSION . 10. FUEGO DE NOCHE NIEVE DE DIA . 11. SHE BANGS-SPANISH VERSION . 12. BON BON DE AZUCAR . 13. FUEGO CONTIA FUEGO . 14. TE EXTRANO TE OLVIDO TE AMO . 15. POR ARRIBA POR ABAJO . 16. EL AMOUR DE MI VIDA .